There is a saying that a picture is worth a thousand words. This book without text proves that. 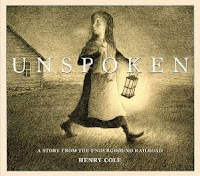 With incredible pencil illustrations the story is told of a young farm girl that discovers a runaway slave and helps in any small way that she can. Knowing these events took place again and again in history, and some not as successful as this, makes this a very moving book. It is incredibly powerful and touching. This book was written to honor a family's oral tradition of stories about the civil war and life in and around some of those events. It is a story told without words, and two characters that communicate and develop a bond without words. This book was incredible and one of my favorite books this year!